This is one of the largest of the hummingbirds that occurs in the United States. In this sculpture it is shown feeding on the nectar of a coral bean pod. In this distinctly delicate and complicated work, the harmony and beauty of the composition suggests far eastern artistic influences and creates a universal appeal. Rivoli Hummingbirds are a favorite sighting during bird watching. Chester Comstock's sculpture shows this jewel of the hummingbirds in its full glory. 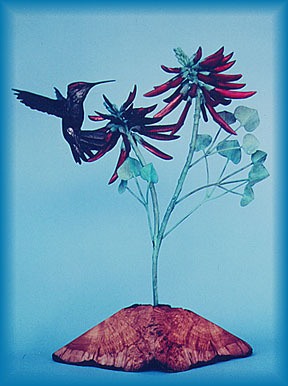 This art was created after a bird watching expedition to the Sonora Desert Museum in Tucson AZ. "To Collect a Comstock Is to Own a Classic"
To place an order contact us Inquiries02@artsales.com and an individual sales representative will contact you to assist you with your transaction.